Hatsune Miku isn’t just a cute anime girl that happens to have the voice of a digital angel, and appear in some of the most entertaining rhythm games ever release. No. Think about Miku a little more deeply and she is of interest to a whole host of sociological and economic discussions and philosophies that are well worth pondering over. 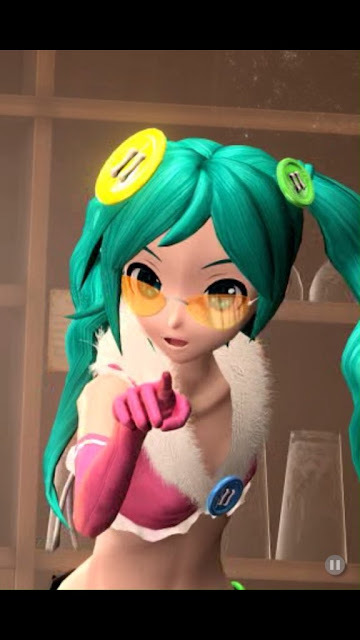 For one example, consider this; Miku could very well be a champion for post-scarcity economic theory put into practice. Yes, that’s right, Miku is communist. But first, post-scarcity. From Marx right through Keynes, economists that consider post-scarcity something worth obtaining (if not an inevitable consequence of economic development), would have approved of Crypton’s virtual girl and what she represents. Because, what Miku represents to music production is in a very real sense a micro-example of what a post-scarcity economic ecosystem might look like. Post-scarcity economics is quite a simple concept, and though there’s an awful lot of thinking and theory behind it, if we were to simplify it down to squeeze into a single paragraph it can be really described as so: Post-scarcity economics works on the principle that between automation and efficient production methods there is enough stuff created so that everyone can access that stuff without anyone being left without. It’s a pretty revolutionary way of thinking, given that it would spell the end of the founding principle of capitalist and consumerist economic models; which mandates there isn’t enough stuff to go around, so supply and demand forces can apply a price to it that some people can capitalise on to their ultimate wealth. Post-scarcity economics is not, as some erroneously claim, an indication of a future where no one needs to work, and that work goes away while everyone sits on their backsides and does nothing, even as stuff falls in their laps. There’s a really good article over at Medium which looks at Star Trek as a theoretical example of a post-scarcity utopia (which it is), and in the show the people in Star Trek obviously continue to work. Rather, a post-scarcity world is a world where people are not compelled to do work without incentive beyond monetary gain. Menial work on assembly lines, for example, or dangerous tasks such as mining, would be achieved through robotics or even AI. It won’t be necessary for people to work a 9-5 job. This is seen as a good thing, because it frees people up to take on more creative or high-thought kinds of work based more closely on their interests; we would have more artists, more academics, more scientists, and more athletes. Now there’s a lot of resistance to the idea of a post-scarcity economy. Part of it is the natural gut reaction that conservatives have to the very idea that Marx or Keynes could be on to a good idea. The kind of people who believe “communism” is a dirty word, despite rarely having studied Marx’s writings to any meaningful depth, are always going to react poorly to the idea that we can change how (and why) people work without having society break down. The good news is that despite the resistance, there are examples of a post-scarcity economy emerging. It’s certainly not widespread, but for now we’re seeing examples of post-scarcity economic ecosystems working in little pocket universes of their own, and Hatsune Miku is one of them. Music production has been an industry heavily reliant on generating and maintaining scarcity. If you want to create a music track that has any semblance of the kind of quality that you get in commercial CDs or downloads that you get from your local CD shop or iTunes, you need to achieve a series of circumstances, all of which are a significant investment because, relatively speaking, access to them is in limited supply. Specifically, if you want to create a quality music track, you need access to a recording studio, for a start. You’d probably hire that. That recording studio needed a whole range of high-quality musical equipment, recording equipment, and software. You’ll also need to have a producer to help create the track. You could potentially set all these things up for yourself, but that then tacks on another huge expense from the outset. And if you were an aspiring music producer or writer, you needed to find talent to make your music a reality. Hiring singers is expensive in its own right, and it only becomes moreso if you’re looking to recruit a celebrity name to record the performance. Because talented singers, let alone celebrity artists, build their careers around their skillsets being uncommon. Yes, celebrity itself is a resource of scarcity. It’s a resource worth an awful lot of money, because the various industries (film, music, fashion), also expend a lot of resources of their own to create and minimise the availability of that resource. That's how they profit off it. Where this is all unfortunate is the reality that celebrity, as a resource, is entirely distinct from talent, meaning that the talent often operates in the shadow of the manufactured (and thus scarce) resource. In other words, the music industry profits as much – if not moreso – from celebrity, rather than talent, and this means a lot of talent goes unrealised if it can't be commercialised as celebrity. Starting with the technology side of things; the Hatsune Miku software costs $Aus300 (give or take), and comes with a perfectly workable prosumer software package that allows you to add her voice to other digital instruments, or recorded, music. So for $300 – an amount almost anyone serious about music production could come up with – you will be set up with a studio environment and have a ‘singer’ at your beck & call, 24/7. But you could probably hire a decent singer busking on the streets for a recording session for $300 anyway. There are plenty of talented, aspiring musicians that would work for minimal pay in order to get exposure. And that’s not going to break the economic systems that drive the music industry. What Miku comes with, which really sets her up as a disruptive force, is her celebrity. 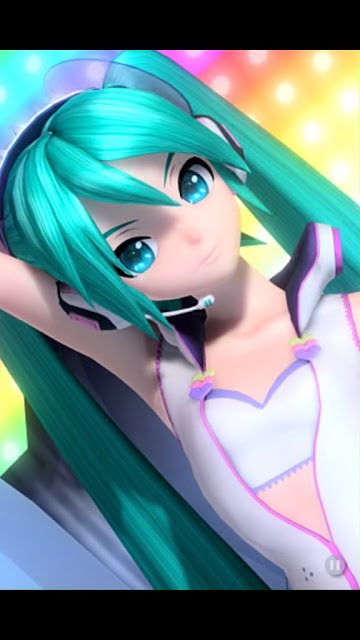 Hatsune Miku is a bona fide global superstar and an icon of Japanese culture and entertainment. She’s about to embark on a full tour of America that she is headlining. She’s been performing to sell-out crowds in Japan for years now. She’s been to Europe, and through mainland Asia. Her music hits high on the charts. Her games sell well. CD shops have entire shelves dedicated almost exclusively to her. 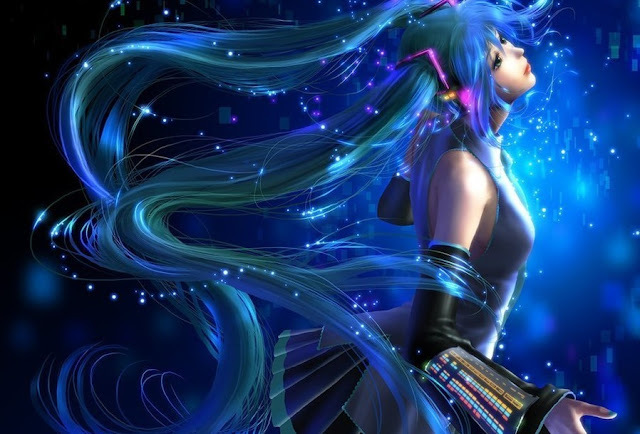 If you create music using Hatsune Miku, you are not just getting access to a voice. You’re accessing the highly scarce celebrity resource. This holds major ramifications for the music industry. In democratising music production – now everyone can make commercially-viable music CDs, headlined by a celebrity, with a little bit of creativity and $300 – Miku and other vocaloids are going to start to pull the ownership of the music media production process away from the traditional production channels, and now everyone can the exact same thing that they enjoy listening to. It goes beyond that too. There is free software allows people to design and choreograph dance routines for Miku, and the drawings of fans often become “official” costumes as they grow in popularity. The cream of this crop makes its way into the games and Miku concerts; that’s right – all that stuff is very much fan driven. So, suddenly, with Miku, rather than a small team deciding who gets to be a music artist, and then carefully construct the celebrity image before rolling it out, the entire fan base is an active participant in the process. This is post-scarcity in action. With Miku it is quality that determines what succeeds and what does not, but everyone gets a fair shot. Yes, there are some people that work with Miku who obtain a level of celebrity themselves – OSTER Project or Mitchie M, for example – but there are no economic forces presenting anyone else with talent from achieving much the same. And, further, Miku herself is not presented as a scarce resource. Yes, you can buy the music CDs or games, and you do need to pay to go to concerts (and unfortunately there is a bit of scarcity going on there, because it is very hard to get tickets at times), but Crypton does not enforce copyright over non-commercial uses of Miku. You can draw whatever fanart you like, create whatever music piece you like, and share these with other fans via a website Crypton specifically set up for that purpose – Piapro. So access to Miku is not reliant on having access to scarce resources (cash), either. Miku obviously exists within a consumerist, capitalist market, so there can be no perfect example of complete post-scarcity economics as long as that is the case, but nonetheless, Miku does give us a most tantalising taste of a complete package, in which she is not only a celebrity available to all, but an example of an environment where the only work that actually matters is the talent of whoever is using her. Item Reviewed: Game Theory: What Hatsune Miku teaches us about post-scarcity economic theory 9 out of 10 based on 10 ratings. 9 user reviews.